For other uses, see Nicorette (disambiguation). Nicorette is the brand name of a number of products for nicotine replacement therapy (NRT) that contain nicotine. Developed in the late 1970s in Sweden by AB Leo in the form of a chewing gum, Nicorette was the first nicotine replacement product on the market. The Nicorette product range encompasses chewing gum, lozenges, patches of two kinds (transparent and non-transparent), oral spray (Nicorette QuickMist), inhalator, sublingual tablets (Nicorette Microtab) and nasal spray. Nicorette products are manufactured by McNeil Consumer Healthcare company, a subsidiary of Johnson & Johnson. GlaxoSmithKline is the licence holder of Nicorette gum in the United States while Johnson & Johnson markets Nicorette globally. NRT products including gum and transdermal patches are on the WHO Model List of Essential Medicines. The brand name "Nicorette" comes from "nicotine" and Swedish: rette, "right way". Nicorette products are indicated for the relief of withdrawal symptoms associated with nicotine withdrawal and to aid in smoking cessation. It is suggested that Nicorette products should be used in "conjunction with a behavioural support programme". Prior to 2005 nicotine products in Britain were only licensed to "assist smokers who were making an immediate and complete quit attempt". Following advice from a working group set up by the Committee on Safety of Medicines (since 2005 the Commission on Human Medicines) the MHRA concluded that NRT products should be used also by those who are unable to stop abruptly. reduce the amount smoked in those not immediately motivated to quit. Nicorette products (like all other NRT products) are most beneficial for heavy smokers (more than 15 cigarettes per day). There are not enough studies to show that NRT helps those who smoke fewer than 10 cigarettes per day. The typical contraindication (reason to not use) for Nicorette products is hypersensitivity to nicotine. Up until recently cardiovascular disease was considered to be a contraindication to nicotine replacement therapy products. However, in 2003 the French Agency for the Safety of Health Products (AFSSAPS) removed all cardiovascular and cerebrovascular disease contraindications. In 2005 the UK Medicines and Healthcare Products Regulatory Agency followed suit. The rationale is that the benefit of nicotine replacement therapy outweighs the risks of nicotine medication, even in smokers with cardiovascular disease. In 2013 the US FDA stated that the contraindication concerning usage of NRT products while smoking is no longer valid. The FDA approved labeling for Nicorette products with a warning concerning pregnancy and breastfeeding: "This medicine is believed to be safer than smoking. However, the risks to your child from this medicine are not fully known". The FDA suggests not using Nicorette products if the patient continues to smoke, or use chewing tobacco, snuff or other nicotine-containing products. taken a prescription medicine for depression or asthma. Specific contraindications listed by the FDA for various formats include sodium-restricted diet, stomach ulcer of diabetes (for gums and lozenges), or an allergy to adhesive tape or skin problems (for patches). The FDA suggests stopping use of Nicorette products in cases of irregular heartbeat or palpitations, symptoms of nicotine overdose (nausea, vomiting, dizziness, weakness, and rapid heartbeat) or skin redness caused by the patch. Nicorette chewing gum releases nicotine while chewing. Nicotine then is absorbed across the oral mucosa into the systemic circulation. Patients are advised to chew the gum slowly and intermittently to avoid the risk of releasing too much nicotine. It is also suggested not to eat or drink while chewing since foods and beverages can reduce nicotine absorption. Nicorette chewing gum is available in two strengths: 2 mg/piece and 4 mg/piece. Dosing would depend on the degree of nicotine dependence: light smokers should use 2 mg gum, heavy smokers (more than 25 cigarettes a day) should use 4 mg gum. Patients should chew gum once they feel the craving. The average adult dosage is 9 to 12 pieces per day. FDA limits maximum daily amount of 2 mg gums to 24 pieces. It is suggested to use gum following a 12-week schedule, reducing the amount of gums consumed by the end of the therapy. The patches provide slow absorption of nicotine into blood within the day and work for 16 hours. They are usually applied in the morning and removed at bedtime. The patch supports smoking cessation within 12 week programme: 25 mg patch (25 mg nicotine over 16 hours) for eight weeks (Step 1), 15 mg patch for two weeks (Step 2), 10 mg patch for the last two weeks (Step 3). Light smokers (less than 10 cigarettes per day) were recommended to start at Step 2 (15 mg) for eight weeks and reduce the dose to 10 mg for the last four weeks. Microtab supplies nicotine to the body orally. It is different from the chewing gum because instead of chewing the patient should allow the tablet to dissolve slowly under the tongue (the tablet dissolves in about 20-30 minutes). The action is similar to 2 mg nicotine gum. Microtabs are used either for smoking cessation or smoking reduction. For smoking cessation the standard dose is one tablet (2 mg) per hour for patients who smoke less than 20 cigarettes per day. When the craving is strong two tablets can be taken instead of one. Most patients require between 8 and 24 tablets per day. British Medicines and Healthcare Products Regulatory Agency recommends not to exceed 40 tablets per day limit. Treatment should be stopped when daily consumption is around 1-2 tablets per day. Nicorette QuickMist spray is a liquid solution spray in a polyethylene terephthalate (PET) bottle placed in a dispenser with a mechanical spray pump. One bottle contains 13.2 ml of solution (at least 150 sprays). The solution consists of 1 mg of nicotine, propylene glycol, anhydrous enthanol, trometamol, poloxamer 407, glycerol, sodium hydrogen carbonate, levomenthol, mint flavour, cooling flavour, sucralose, acesulfame potassium, hydrochloric acid and purified water. Spray is administered when one has a desire to smoke. MHRA suggests not to use more than 2 sprays at a time, up to 4 sprays per hour and no more than 64 sprays per 24 hours period. Nicorette Quickmist is considered to be the most advanced format of nicotine replacement therapy due to the speed of action. As explained by Gay Sutherland, research Psychologist at the Tobacco Research Unit, Kings College "after taking a puff on a cigarette, smokers get nicotine hit to the brain within around 20 seconds. Most nicotine replacement therapies can take between 30 minutes and three hours to deliver their effect" while Nicorette Quickmist has a proven ability to deliver nicotine to the brain within 60 seconds. There is also clinical data proving that using Nicorette Quickmist double the chances of successfully quitting compared to willpower alone (a relatevie success rate of 2.48 compared to placebo regarding abstinence at 1 year). The Nicorette brand started with a nicotine chewing gum developed in Helsingborg (Sweden) by the company Leo AB, later part of Pharmacia & Upjohn. It was the first product for nicotine replacement therapy and gained its inventor, Ove Fernö, titles like "the founding father of modern pharmacotherapy for smoking". The first nicotine chewing gum was produced at AB Leo in 1971. The innovation was in the use of ion-exchange resin (polacrilex) in order to control the rate of release of nicotine during chewing. Fernö explained, "Putting nicotine into chewing gum is not an invention. Fixing the nicotine to an ion exchange resin and putting that in a chewing gum to enable the chewer to control the rate of release—that is an invention". :1220 The same year Håkan Westling, Professor of Clinical Physiology at Lund University, started the first clinical trials of the gum as an aid to smoking cessation at the university hospital. Westling's findings were presented at the Second World Conference on Smoking and Health in London:146 and were published in 1973 in the journal Psychopharmacologia together with an article by Fernö. Nicorette was registered as a drug in Switzerland in 1978, in Canada in 1979, and in the UK in 1980.:147 It was registered in Sweden in 1981. Initially the Swedish Medical Products Agency declined to approve Nicorette as a medicine because it considered smoking not an addiction, but a lifestyle choice; and the Swedish National Board of Health and Welfare regarded orally consumed nicotine products not as medicine but as foodstuffs. On January 13, 1984 Nicorette chewing gum was approved by the US Food and Drug Administration after a 34-month review. It was brought to the US market by Marion Merrell Dow under licence from AB Leo. The Nicorette Patch was introduced to the market in 1991 and the nasal spray in 1994. In 1996 the FDA approved the switch of Nicorette gum and the NicoDerm CQ transdermal nicotine patch to over-the-counter status in the US. 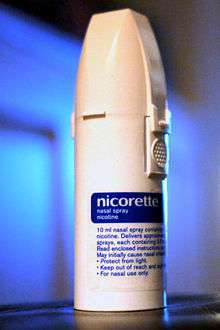 The Nicorette inhaler was launched in 1996 and Nicorette Microtab (sublingual tablets) in 1999. In 2002 the FDA changed the status of Commit lozenges to over the counter in the US. In 2004 Nicorette launched Peppermint, the first coated nicotine gum. A shell coating containing a sugar substitute (xylitol) and flavouring masks the nicotine taste. In 2005 Nicorette introduced Fresh Mint chewing gum. In December 2008 Nicorette introduced a new semi-transparent nicotine patch under the trade name "Invisipatch". As stated by the UK Medicines and Healthcare Products Regulatory Agency, in addition to this more discreet patch to encourage better customer compliance, new Nicorette transdermal patches have been developed to: reduce patch size; add a higher dosage strength of 25 mg of nicotine to the previously available 5, 10 and 15 mg; and increase the proportion of bioavailable nicotine). In 2009 Nicorette introduced "Icy White" chewing gum with teeth whitening and Nicorette Mentolmint, a chewing gum with softer menthol taste. At the end of November 2010 Nicorette introduced QuickMist 1 mg mouthspray, which provides more rapid absorption of nicotine than lozenges or gum. In January 2011 Nicorette UK launched the ActiveStop mobile app for iOS featuring target setting, a wish list, distractions, achievement sharing, information and games. Nicorette has been sponsoring yacht racing since 1993 when it partnered with Ludde Ingvall, a Finnish-born Swede who started a non-smoking team in 1991. In 1995 the Nicorette team was banned from the Cape to Rio Race, sponsored by the tobacco company Rothmans. The captain of “Nicorette” protested against the decision, saying that “Rothmans is scared of the boat and the healthy lifestyle it seeks to promote”. A spokesperson for the organizing committee of the race later admitted that the yacht was barred because they considered the product to be in competition with the sponsor's product. In the same year the yacht won the Fastnet Race. In 1997 the yacht broke the Transatlantic mono-hull record, covering the route from New York City to Lizard Point (Great Britain) in 11 days 13:22.58. Second and third generations of “Nicorette” won the Sydney to Hobart Yacht Race in 2000 and 2004. During the 90s Nicorette (GlaxoSmithKline) has been sponsoring Dennis Vitolo (ex-smoker) in Payton Coyne Racing and The Grand Prix of Miami. In 2005 the brand entered NASCAR race sponsorship with Casey Mears. 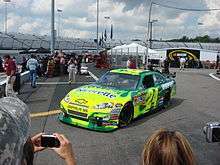 Since 2006 Nicorette is sponsoring Hendrick Motorsports with Jeff Gordon's car. The brand also runs the Nicorette's Quit Crew program to help racers quit smoking. Apparently the brand is supporting car races because NASCAR fans are heavy smokers. 1 2 Edney, Anna (2014-06-12). "E-Cigarettes May Get Advantage for Not Containing Tobacco". Bloomberg News. Archived from the original on 2014-12-25. Retrieved 2014-12-25. 1 2 3 4 Higgins, Andrew (2013-11-09). "Aided by Army of 'Vapers,' E-Cigarette Industry Woos and Wins Europe". Brussels: The New York Times. p. 2. Archived from the original on 2014-12-25. Retrieved 2014-12-25. ↑ Norton, Amy (2012-02-27). "Nicotine quick-fix mouth spray helps some quitters". New York: Reuters. Archived from the original on 2014-12-25. Retrieved 2014-12-25. ↑ Rutter, Paul (2013). "Nicorette". Community Pharmacy: Symptoms, Diagnosis and Treatment. Elsevier Health Sciences. p. 320. ISBN 9780702054730. ↑ Kitamura, Makiko (2014-02-19). "Glaxo Memo Shows Drug Industry Lobbying on E-Cigarettes". Bloomberg News. Archived from the original on 2014-12-25. Retrieved 2014-12-25. ↑ "WHO Model List of Essential Medicines 18th list (April 2013) (Final Amendments – October 2013)" (PDF). World Health Organization. 2013. Archived from the original (PDF) on 2014-12-25. Retrieved 2014-12-25. 1 2 3 4 5 Larsson, Bengt; Letell, Martin; Thörn, Håkan (2012). "9.5 The rise of medicinal nicotine in Sweden". Transformations of the Swedish Welfare State: From Social Engineering to Governance? (1st ed.). Palgrave Macmillan. ISBN 0230363954. 1 2 3 "Nicorette Invisi 10 mg patch, Nicorette Invisi 15 mg patch, Nicorette Invisi 25 mg patch, PL 15513/0159-61" (PDF). Medicines and Healthcare Products Regulatory Agency. 2008-12-02. Archived from the original (PDF) on 2015-01-09. Retrieved 2015-01-09. 1 2 3 "MHRA Public Assessment Report: The use of nicotine replacement therapy to reduce harm in smokers, February 2010" (PDF). Medicines and Healthcare Products Regulatory Agency. 2010. Archived from the original (PDF) on 2015-01-09. Retrieved 2015-01-09. 1 2 "Nicorette Peppermint 2 and 4 mg gum, Nicorette Ice Mint 2 and 4 mg gum, Nicorette Spearmint 2 and 4 mg gum, PL 15513/0136-7, PL 15513/0143-4, PL 15513/0152-3" (PDF). Medicines and Healthcare Products Regulatory Agency. 2006-07-18. Archived from the original (PDF) on 2015-01-09. Retrieved 2015-01-09. ↑ "Report of the Committee on Safety of Medicines Working Group on Nicotine Replacement Therapy, November 2005" (PDF). Medicines and Healthcare Products Regulatory Agency. 2005. Archived from the original (PDF) on 2010-12-14. Retrieved 2015-01-09. ↑ David C. Dugdale, III. "Nicotine replacement therapy". MedlinePlus. U.S. National Library of Medicine. Archived from the original on 2015-01-09. Retrieved 2015-01-09. ↑ "Nicotine is not a significant risk factor for cardiovascular events. The benefit of nicotine replacement therapy outweighs the risks of nicotine medication, even in smokers with cardiovascular disease". The Society for Research on Nicotine and Tobacco (SRNT). 2014-12-16. Archived from the original on 2015-01-09. Retrieved 2015-01-09. ↑ "Nicotine Replacement Therapy Labels May Change". Food and Drug Administration. 2013-04-01. Archived from the original on 2015-01-09. Retrieved 2015-01-09. 1 2 3 4 5 6 "Nicorette, Nicotine Polacrilex, Labeling Revision 10/30/2014" (PDF). Food and Drug Administration. 2014-10-30. Archived from the original (PDF) on 2015-01-09. Retrieved 2015-01-09. 1 2 "Nicoderm, Labeling Revision 10/30/2014" (PDF). Food and Drug Administration. 2014-04-30. Archived from the original (PDF) on 2015-01-09. Retrieved 2015-01-09. ↑ "New high-strength nicotine patch". Monthly Index of Medical Specialities. 2009-02-24. Archived from the original on 2015-12-31. Retrieved 2014-12-31. 1 2 Willis, Nicola (2012). "Which Treatment?". Stop! No Smoking Programme. Random House. p. 69. ISBN 1448148952. ↑ "Public Assessment Report: Nicorette Microtab Lemon 2mg sublingual tablets. Nicotine bitartrate dihydrate, PL 15513/0156" (PDF). Medicines and Healthcare Products Regulatory Agency. 2009-06-30. Archived from the original (PDF) on 2015-01-18. Retrieved 2015-01-18. 1 2 3 "Nicorette Quickmist 1mg/spray Mouthspray - PL 15513/0357" (PDF). Medicines and Healthcare Products Regulatory Agency. 2010-11-30. Archived from the original (PDF) on 2015-12-31. Retrieved 2014-12-31. 1 2 Tønnesen, Philip; Lauri, Hans; Perfekt, Roland; Mann, Karl; Batra, Anil (February 9, 2012). "Efficacy of a nicotine mouth spray in smoking cessation: a randomised, double-blind tria" (PDF). European Respiratory Journal. European Respiratory Society. 40 (3): 548–54. doi:10.1183/09031936.00155811. PMC 3432241 . PMID 22323576. ↑ "Spray your way to a smoke-free New Year". Easier.com. 2012-01-05. Archived from the original on 2015-07-01. Retrieved 2015-07-01. ↑ Gallagher, Tony (2011-05-04). "Lifecoach: I'm putting on weight but can't face the gym". The Daily Telegraph. Archived from the original on 2015-07-01. Retrieved 2015-07-01. ↑ Raw, Martin (2012). "Who invented NRT". How To Stop Smoking And Stay Stopped (1st ed.). Random House. p. 79. ISBN 1446417883. 1 2 3 4 "JOURNAL INTERVIEW—35: Conversation with Ove Ferno". Addiction, 89. 1994. pp. 1215–1226. Archived from the original on 2015-01-05. Retrieved 2015-01-05. ↑ Brantmark B, Ohlin P, Westling H (1973-07-19). "Nicotine-containing chewing gum as an anti-smoking aid.". Psychopharmacologia. 31 (3): 191–200. doi:10.1007/bf00422509. PMID 4581737. ↑ Fernö O. (1973-07-19). "A substitute for tobacco smoking.". Psychopharmacologia. 31 (3): 201–204. PMID 4732726. ↑ Kalkhoff, Will; Thye, Shane R.; Lawler, Edward J. (2012). "The Birth of Medicinal Nicotine". Critical Perspectives on Addiction (1st ed.). Emerald Group Publishing. p. 79. ISBN 1780529317. ↑ "Merrell Dow Nicorette Anti-Smoking Rx Chewing Gum Trade Shipments". The Pink Sheet. 1984-01-23. Archived from the original on 2015-01-05. Retrieved 2015-01-05. ↑ "COMPANY NEWS; Nicotine Patch Marketing Deals". The New York Times. 1991-08-22. Archived from the original on 2015-01-01. Retrieved 2015-01-01. 1 2 3 4 "Nicorette" (PDF). Superbrands. 2010. Archived from the original (PDF) on 2015-01-05. Retrieved 2015-01-18. 1 2 "Now Available Without a Prescription". Food and Drug Administration. 2011-08-12. Archived from the original on 2015-01-18. Retrieved 2015-01-18. ↑ "P&U launches sublingual NRT". Chemist + Druggist. 1999-01-16. Archived from the original on 2015-01-01. Retrieved 2015-01-01. ↑ Prashant, K. Pagare; Chandrakant, S. Satpute; Varsha, M. Jadhav; Vilasrao, Kadam (2012-06-23). "Medicated Chewing Gum: A Novel Drug Delivery System" (PDF). Journal of Applied Pharmaceutical Science. 02 (06): 40–54. doi:10.7324/JAPS.2012.2706. Archived from the original (PDF) on 2015-01-18. ↑ Gad, Shayne Cox, ed. (2008). Pharmaceutical Manufacturing Handbook: Production and Processes. John Wiley & Sons. p. 259. ISBN 978-0-470-25980-1. ↑ Hendrix, Jerry; Hayes, Darrell (2009). "Exhibit 8-4a". Public Relations Cases (8 ed.). Cengage Learning. p. 300. ISBN 0495567787. 1 2 "Nicorette Invisi 10mg, 15mg, 25mg patches - PL 15513/0159-61" (PDF). Medicines and Healthcare Products Regulatory Agency (UK). 2008-12-02. Archived from the original (PDF) on 2015-12-31. Retrieved 2014-12-31. ↑ "Gum ad screened during The Simpsons 'inappropriate'". Metro. 2009-09-30. Archived from the original on 2015-01-01. Retrieved 2015-01-01. ↑ Chaplin, Steve (July 2011). "Nicorette QuickMist: rapidly absorbed NRT mouthspray". Prescriber. Prescriber. 22 (13-14): 26–28. doi:10.1002/psb.776. Archived from the original on 2015-12-31. ↑ Ratcliffe, Jack (2011-01-05). "Nicorette's ActiveStop anti-cigarette iPhone app". Latestgadgets.co.uk. Archived from the original on 2015-12-31. Retrieved 2014-12-31. ↑ "New iPhone app launched to help smokers quit". Metro. 2011-03-09. Archived from the original on 2014-12-31. Retrieved 2014-12-31. ↑ Hammond, Ross (2000-01-07). "Tobacco Advertising & Promotion: The Need for a Coordinated Global Response" (PDF). New Delhi: World Health Organization. Archived from the original (PDF) on 2015-01-23. Retrieved 2015-01-23. ↑ "PLUS: YACHT RACING; Frenchman Breaks Trans-Atlantic Mark". The New York Times. 1998-07-08. Archived from the original on 2015-01-23. Retrieved 2015-01-23. ↑ Tait, Paul (2000-12-29). "Rough rider Nicorette takes Sydney-Hobart". The Guardian. Archived from the original on 2015-01-23. Retrieved 2015-01-23. ↑ Schlotter, Bill (1997-09-26). "MOTOR SPORTS : DRIVING OFF TOBACCO ROAD.(SPORTS)". Los Angeles Daily News. Archived from the original on 2015-01-01. Retrieved 2015-01-01. ↑ "MARKETING: Breaking Away From the Packs". Newsweek. 1999-03-29. ↑ "NASCAR leaves smoking days farther behind". ESPN. 2005-01-27. Archived from the original on 2015-01-08. Retrieved 2015-01-01. 1 2 Horovitz, Bruce (2005-01-26). "Nicorette, NASCAR sign sponsorship deal". USA Today. Archived from the original on 2015-01-01. Retrieved 2015-01-01. ↑ "Nicorette to Join No. 24 Team in 2006". Hendrickmotorsports.com. 2005-10-14. Archived from the original on 2015-01-01. Retrieved 2015-01-01. ↑ Coble, Don (2007-04-10). "Nicorette gum helps NASCAR shift gear on smoking sponsors". Savannah Morning News. Archived from the original on 2015-01-01. Retrieved 2015-01-01.